Will You Be My Bridesmaid? 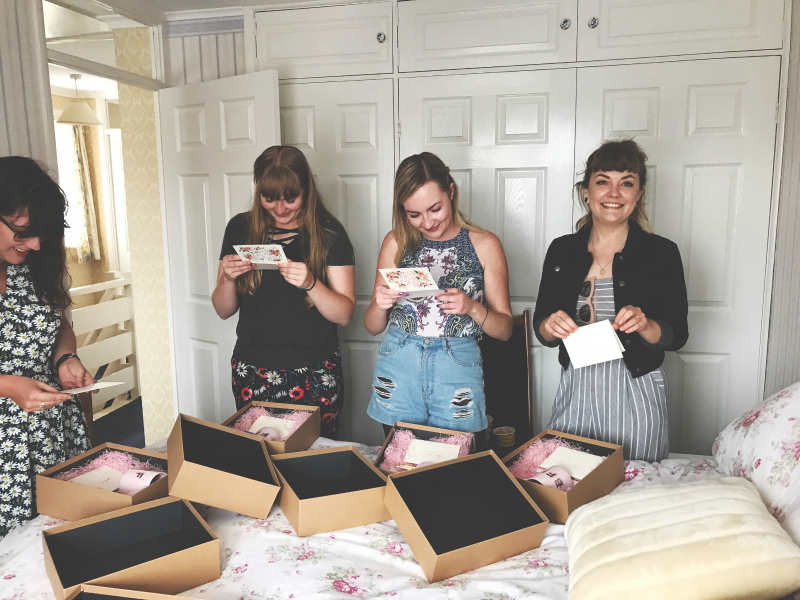 Boxes + Meet My Bridesmaids! This weekend just gone, I held a little belated birthday party that, luckily, all of the women that I wanted to be in my bridal party happened to be attending. 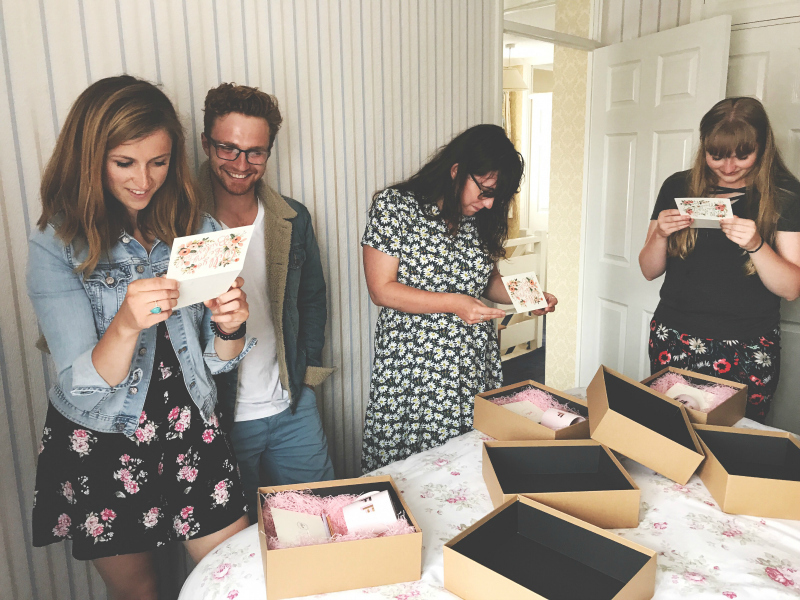 Realising how unheard of that is, as they're from different friendship groups, I decided to jump the gun a bit with wedding planning and go straight to the part where I get to propose with a cute box of gifts to my desired bridesmaids! 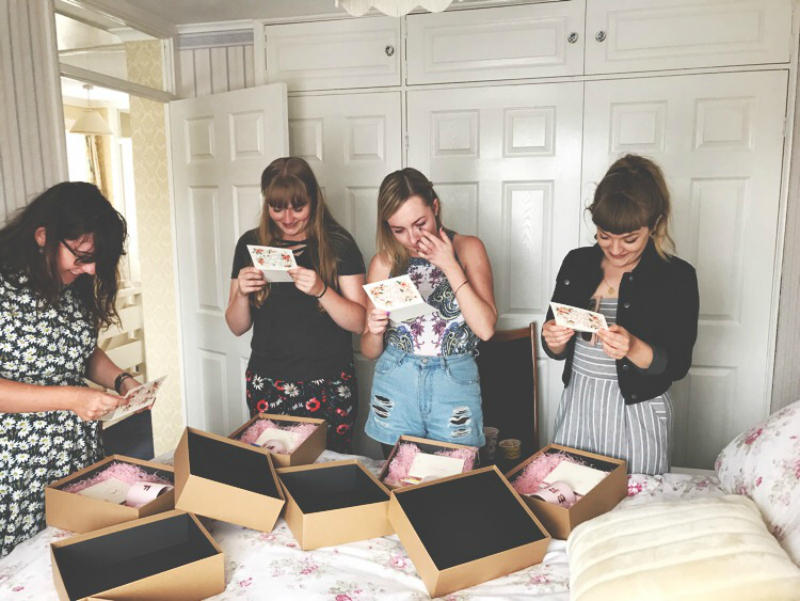 I kept it a secret for them all so when they opened their boxes they had no idea what they were going to be faced with. It was excellent! Luke and I haven't even thought about a wedding, let alone made any concrete plans, so this was the first step. I decided to keep the contents of the boxes completely the same. I also kept the items £5 and under because lord knows I am not made of money and, to be honest, I don't think you need to spend much more than that. I love putting pins on my jackets so I thought it'd be cool to include one in the box for my bridesmaids to wear at their leisure or bring along to the big day in some way. The true love pin from Skinny Dip fit the bill perfectly. All of the girls are partial to a good hot drink, or the occasional spot of wine in a mug, so when I saw the ban.do BFF mugs I thought they'd make the perfect addition. Sticking with ban.do, I saw their complimentary pencils and thought that they would make a cute addition to the box too. I had fun assigning the pencils to each person and I think I did a pretty good job with allocating them appropriate slogans. Buying things as a pack and then splitting them down is also a great way to keep costs down if you are, like me, on a budget. 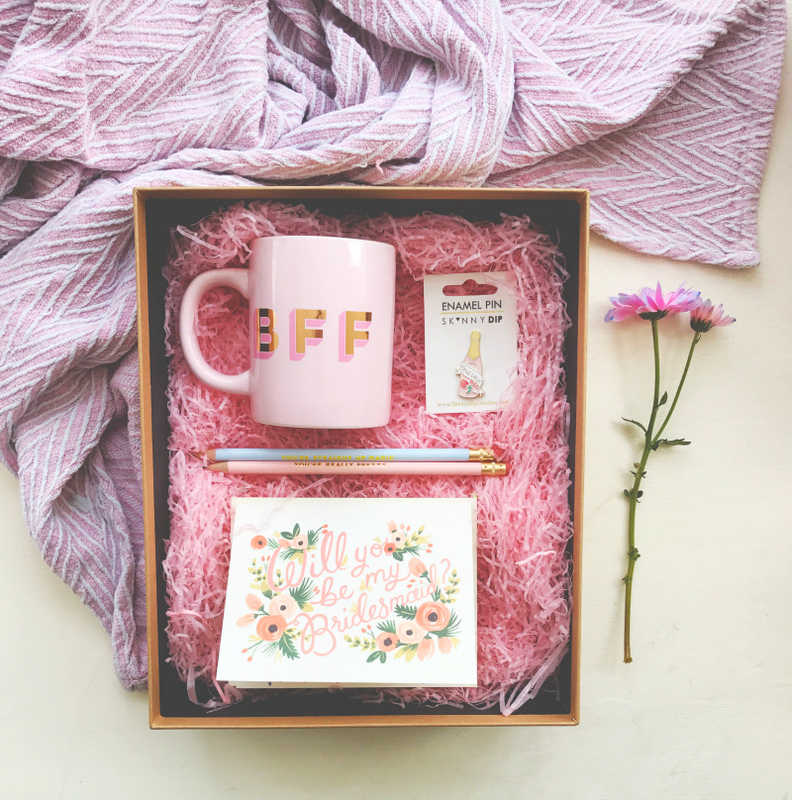 I have been a big fan of Rifle Paper Co. for many years now and I knew that their Will You Be My Bridesmaid / Maid of Honour cards would look really cute in the box and would be the best way to surprise the girls when they opened their boxes. They are pricey for cards, sure, but I made it worth my while by filling the card with lots of soppy stuff for each of them to read and keep. I went for simple Kraft boxes because I wasn't looking for anything particularly busy. You could keep the costs down further by recycling gift bags of yore (we all have a selection) or by tying everything together with ribbon or string instead. The iridescent heart confetti, which is impossible to photograph, the gold glitter letters and the shredded tissue paper were all just ways of making it look a little more cute but they weren't at all essential. 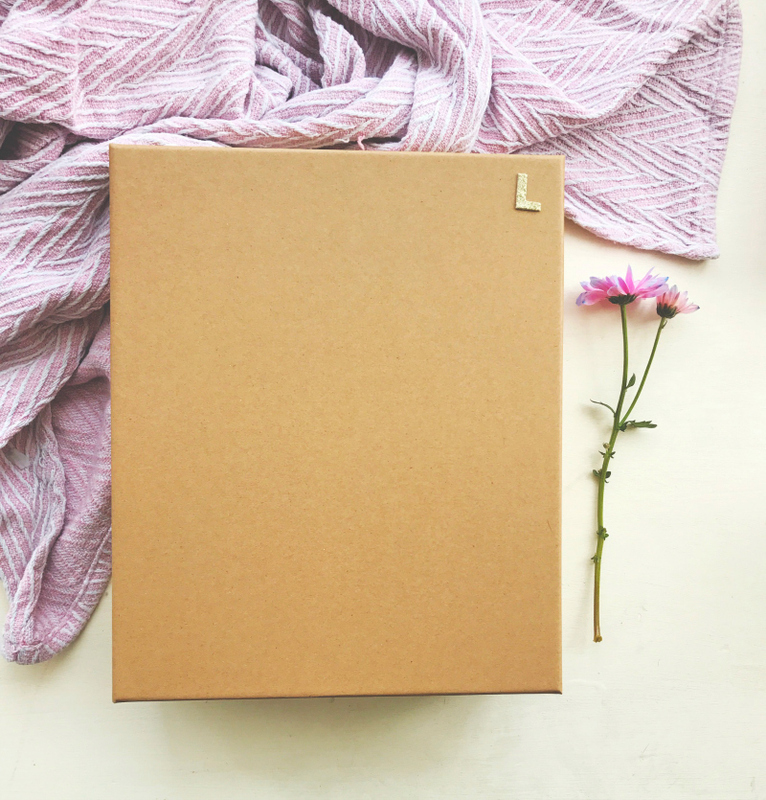 You don't need to create a box, or even give a card, at all. Asking them face-to-face, or via technology, is totally fine. I decided to be a little extra with my bridesmaid proposals because, like a true Cancerian, I will always be driven to go a bit EXTRA where my best friends are concerned. 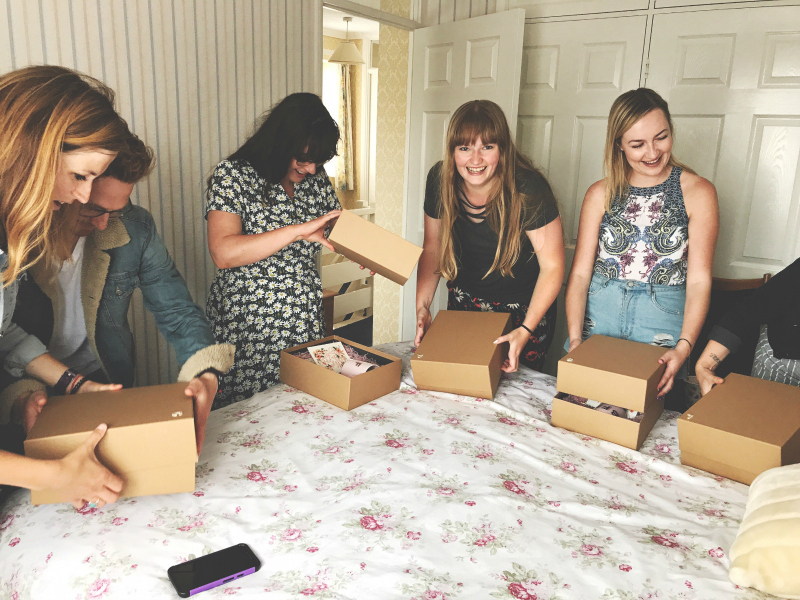 None of them had a clue what was going on because I sneakily spontaneously told them I had just bought them little gifts because I was so grateful for their friendship and support. I decided to host the moment upstairs at my Grandma's as I wanted to keep the moment between us all and I'm so glad I did. It made it all the more special that it was just us. There were a lot of squeals, a lot of tears, and a lot of wide grins. I'm so glad I got to share that special moment with them. Each and every one of them has experienced hardship this year and I wanted to earmark that ten minutes or so just for us to celebrate friendship. It was perfect. I managed to capture a few reactions in photograph form so here's a small selection! This was G's perfect reaction face when she realised what was happening. Sophieanne pulled off some perfect Sinead O'Connor-esque singular tears. Lyzi was grinning, and also gurning, from ear to ear. Even Amy had tears in her eyes and that is unheard of! Claire was effectively wagging her entire body like a little puppy because she has been waiting for this moment for about 5 or so years. The scamp! 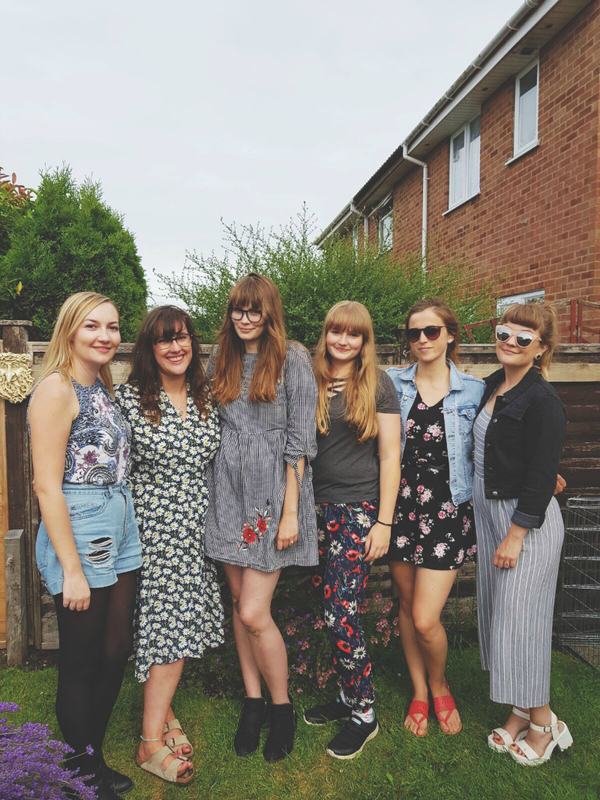 I met Sophie-Anne when she came to our Sixth Form after years of homeschooling. At first, I didn't know what to think of her. She waltzed into our English class and was giving all these really insightful answers to the teacher's questions and we were like, hang on a minute who the hell are you? However, a few hours down the line, and after carefully observing her, I asked her if she wanted to chat and the rest, they say, is history. Sophie-Anne is one of the best people on this planet and I feel so indebted to whoever made our meeting happen because I wouldn't have got through half of the stuff I have gone through without her. She is my role model. You lot always say I'm so strong to deal with all of my health stuff head on but, honestly, I wouldn't be half as strong without her. I love you, Soph. Georgia and I first met in a Facebook group for the people on our university course back in August 2011. We met up as soon as we started lectures and, thankfully, got on straight away. Georgia is the friend you turn to when you're in desperate need of some self-care or self-reflection. A bulk of our shared memories involve treating ourselves right after tough times and I appreciate having someone to remind me to take care when times are tough. She has the most perfect grin and I was so happy to squeeze her to death after a year and a half apart! I love you, G.
Amy, if you can't already tell, is my younger sister. She also happens to be excellent at organising and currently works in event planning so she is the one in charge of sailing the ship! She is essentially Leslie Knope, complete with love of sweet food. Whilst we are very different people at times, we are also pretty similar. You will often find us giggling at things whilst other people around us wonder what the hell is up. We are part of a two girl gang, in a way. We have been through a lot together and I can always count on her to have my back. I love you, Cub. Before I started university in 2011, I joined a Facebook group to try and meet people who were going to be living in the same building as me. I got chatting to a girl who said she'd come and meet me on our first morning and she'd be bringing someone else, who was also on our course, in tow. Little did the girl in tow and I know that we would soon become inseparable. Claire is so inherently Claire, and so unlike most other beings on this planet, and that's what I love about her. Within a week or so of knowing me, she turns and says, 'Shall we be each other's bridesmaid?' and, as weird as I found it, I was so happy to make part of that a reality. I love you, Claire. I met Lyzi online via the blogosophere back in 2010 after I saw a post of hers where she was wearing a Backstreet Boys t-shirt. I'm pretty sure that, in a way, it was fate because we now talk every single day and can't really function without spouting crap at one another. Lyzi is the person I turn to for basically everything, be it emotional chats or rants or really weird niche conversations that would probably creep everyone out. I feel so lucky to be in a weird 'little and large' double act with her and it makes all of this blogging stuff feel worth it knowing that without it I wouldn't have one of my best friends. I love you, Todd. I wouldn't have changed a thing about my bridesmaid proposal. It was perfect and I took so much from being able to see such big grins on their faces. I love them all so dearly. Thank you so much, pals. I wouldn't be half as happy without you all. 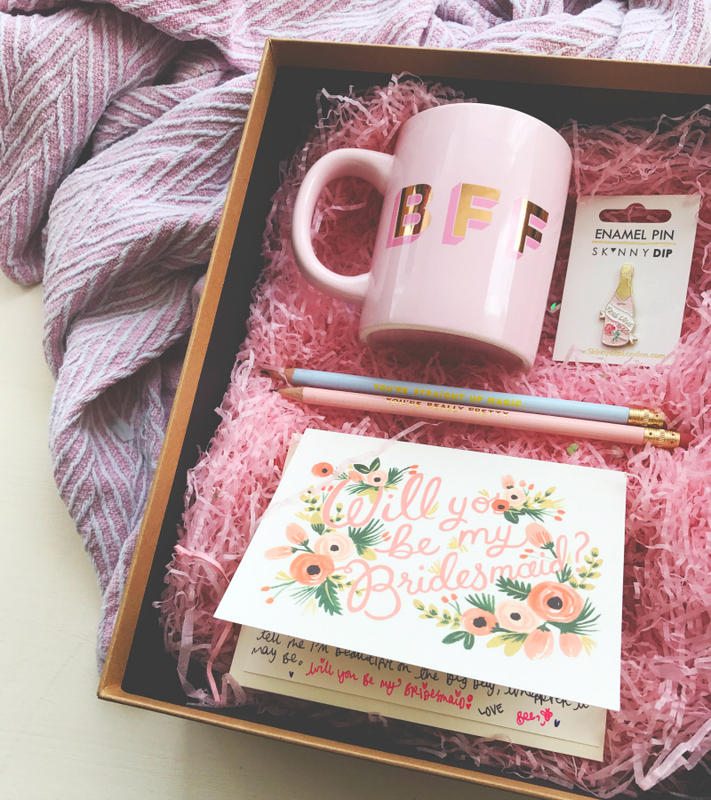 I hope you have managed to find some inspiration for asking: 'Will you be my bridesmaid?'. What do you think? If you're married, how did you propose to your bridesmaids? If you aren't, how would you? Aw, this is such a cute idea! I just got engaged and we're not even thinking of planning anything yet, but I'm definitely going to keep this in mind when the time comes! 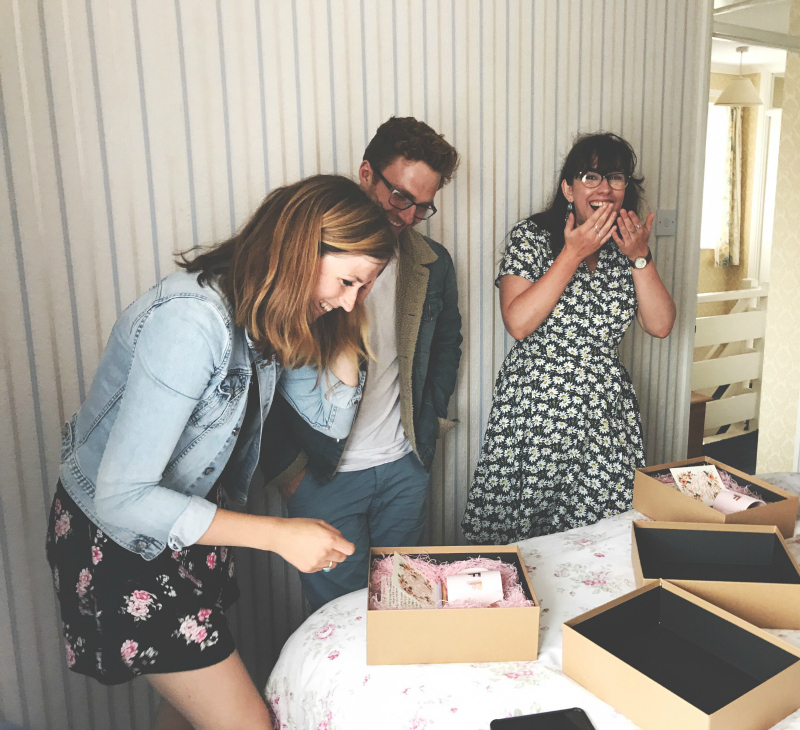 This was a beautiful idea and I love how you their reactions photographed as well - stunning! Thank you thank you thank you from every fibre of my being. You always make me feel so special and loved. This is such a cute idea and I'm so glad you were able to get so many photos of it all so that you've got them to look back on too! Woah! I cannot stop looking at this. I have to share this with my best friend. She is getting married and booked one of the best wedding venues. I surely deserve a box like this. Oh my god! I love it. Her wedding is by the end of this year and I am her bridesmaid. I am not going to waste anymore time here and share this right away.